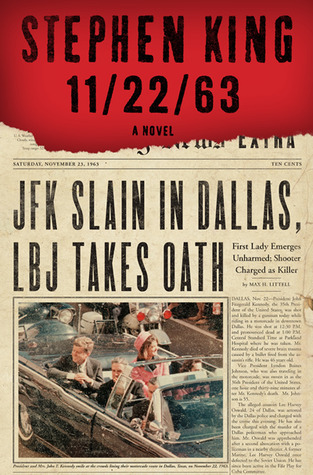 We are now officially halfway through #112263Along, reading Stephen King’s 11/22/63! I reached exactly halfway in the book on Thursday night, but didn’t quite have enough time to get a post up on Friday, November 22—the 50th anniversary of John F. Kennedy’s assassination. So, we know Jake agrees to Al’s plan and goes to 1958 through the time-portal in Al’s diner, to stay until he can thwart Lee Harvey Oswald’s assassination attempt on President Kennedy. First, Jake has a personal errand in the past—saving his friend Harry and his family from Harry’s murderous father in good ol’ Derry, Maine. Derry! Oh Uncle Stevie and your crossover character meet-cutes. Anyway, I don’t want to give away spoilers in this post, but at the halfway point Jake (a.k.a. George) is waiting out Oswald in Jodie, Texas—a small town not far from Fort Worth (where he knows Oswald will end up moving to soon) and Dallas. Jake meets a lot of nice people in Jodie and gets attached to the place despite himself—despite knowing what he must do in just a couple short years. At the exact halfway point I was left with this: “… shortly after that, life as I had come to know it (and love it) in Jodie came crashing down.” (pg. 425) GAH! Here’s another move King makes that proves he’s a master. Just when you get comfortable, he throws a cliffhanging curve-ball at you. I’ve also been super impressed with how much research and detail went into this book. I had a lot of “oh yeah, duh…” moments while reading, coming across things like technology, racism, female sexuality, etc. This week there has been an incredible wealth of information posted about JFK and his assassination. I watched Part 1 of PBS/American Experience’s JFK film and plan to watch Part 2 this weekend. There are a bunch of great articles at Slate, Mother Jones, and The New Yorker. Even some about conspiracy theories and articles positing how the world would have been different if JFK had not been killed (just like 11/22/63 does, pretty much). This entry was posted in activities, books and tagged 112263Along, adventure, book community, challenge, fiction, history, readalong, science fiction, thriller by kristin @ my little heart melodies. Bookmark the permalink. Feeling like I better get reading.